Established in 1913, Maxbauer's mission from the start has been to bring superb meats and friendly service to everyone who walks through our doors. We do this by providing superior cuts of beef, pork, chicken, fresh seafood and succulent smoked sausages, all with a smile. While our specialty is meat, we also supply wine, craft beer, delicious seasonal soups, fresh produce, and other gourmet groceries to ensure we're your only stop for preparing the perfect meal. For over a century, we have created industry-leading standards and established a reputation of having superior customer service, a homey atmosphere, the highest quality products and outstanding dedication to the citizens of Traverse City. Our food is delicious. We have passion for what we do and it shows. Read about what locals and friends from afar are saying about us on our 5-star rated yelp review page. Maxbauer is proud to be partnered with the Northwest Michigan Food Coalition, donating protein to 70+ pantries and kitchens across Antrim, Benzie, Grand Traverse, Kalkaska and Leelanau Counties. Maxbauer also partners with Food Rescue, an organization who distributes food that would otherwise go to waste to shelters and pantries. To date, we have donated well over 100,000 pounds of protein which we believe offers a hand-up to families and children that all of us in northwest Michigan can be proud to call family. Check out our awesome, weekly-updated specials. We hand pick delicious options for you to complement seasonal events, holidays and food trends. Enjoy! Here at Maxbauer, we are proud to sell only USDA Prime and USDA Choice or Higher Certified Beef that is family farm-raised, grass-fed and corn-finished from Iowa Premium Beef. We provide the most delicious, pure, and nutritious chicken possible from Springer Mountain Farms. We know where our meat is sourced, and we want you to as well. 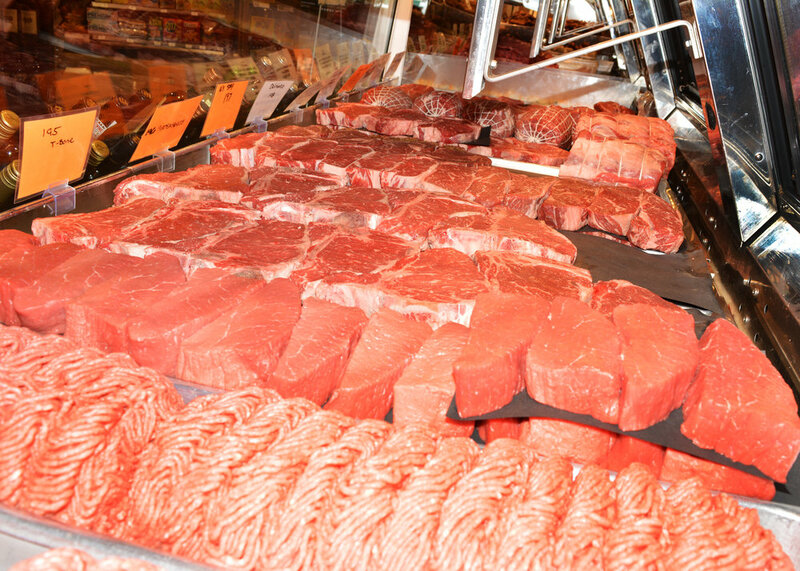 With over 100 years of meat cutting experience on the bench, we are the trusted source for protein in Traverse City and a destination for customers throughout Michigan. We have over 50 seafood choices in-house. Our seafood represents state-of-the-art technology in delivering instantly quick-frozen seafood from the shore to our door from the leading distributor of seafood in America, Wolverine Packing, and their fourth-generation fish monger Angelo Lanava. Iowa Premium Beef. Tenderloin/Filet, Ribeye, Flatiron, Shortribs, Ground Beef, Kabobs, Marinated Steak, and more. PORK - DID WE MENTION BACON? Tenderloin, Pork Chops, Back Ribs, Shoulder, Belly, Ground Pork, Bacon to the MAX, Marinated Chops and Tenderloins, and more. Springer Mountain Farms. Marinated Breasts, Kabobs, Whole Chickens, Chicken Breast, Boneless Thighs, Chicken Legs, Duck, Eggs, and more. Lamb Chops, Leg Steaks, Leg of Lamb, Rack of Lamb, Lollipop Chops, Lamb Shanks, Ground Lamb, Ground Veal, Scallopini, Veal Shanks, Veal Chops, and more. Fresh and Smoked Polish Kielbasa, Brats, Holiday Klabassa, Bulk and Link Sausages, Cherry Brats, Summer Sausage, and over 50+ choices. 10 kinds of bacon including our Legendary Slab Bacon, 3 Bacon Jerkies, Delmonico Beef Jerky, Legendary Beef and Corned Beef Jerky, Turkey Jerky, 3 Chicken Jerkies, 7 flavors of Snacksticks, Frankfurters, and more. As a side or all by themselves, our soups at Maxbauer are always hot and hearty. Our fresh, from-scratch soups change daily. Warm up with a bowl today! Our salads and sandwiches are prepared daily from scratch using only the freshest ingredients from throughout our fresh deli and meat counters. For general inquiries or product requests/questions, please fill out the following form. Please no online orders. To place an order, please call (231) 947-7698.